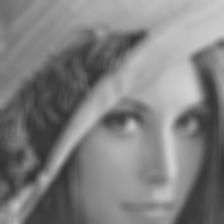 Smooths an image by averaging pixels within a rectangular kernel. Replaces each pixel with the average of all pixels contained in a rectangular kernel. The width of the kernel is 2 * inRadiusX + 1, the height is 2 * inRadiusY + 1. When inRadiusY is set to Auto, then its value is implicitly copied from inRadiusX. Define the size of the kernel by setting inRadiusX and - optionally - inRadiusY. Highest performance will be achieved with inKernel = Box. Other kernel shapes will result is longer execution time. Define inSourceRoi is some pixels of the input images should be ignored (advanced). SmoothImage_Mean performed on a sample image with inRadiusX = 4. DomainError inBorderColor is relevant only when inSourceRoi is set to Auto (NIL) in SmoothImage_Mean. DomainError Not supported kernel on input in SmoothImage_Mean.